Yesterday, in a post about developing existing properties towards becoming transmedia properties, I warned everyone to leave The Phantom be, ’cause he was mine to develop. A jest, naturally, but today it actually got me thinking a bit. See, today, the 17th of February, marks the 75th anniversary for the iconic comic hero, who saw the light of day on this very day in 1936. I found an old Phantom magazine from when I was a kid and had a look; lo and behold, the foundation for a solid transmedia setting is there already! Below is what could be called a Case Study of a Theoretical Transmedia Development (or CSTTD) (happy there were two ”T”:s in that abbreviation, or this post would’ve featured in some quite different google searches) of the existing property The Phantom. The Phantom has always, for some reason, been most popular not in it’s country of origin, USA, but rather in the Nordic countries of Sweden, Finland, Denmark and Norway. 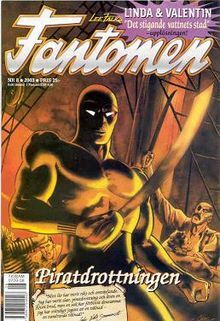 Lee Falk, who created The Phantom, rewrote a lot of the background story at the same time as the actual first strips were being publised in 1936, building an intricate setting which almost could be part of the real world as a framework for the story. The Phantom is, as we all know, over 400 years old. Back then an ancestor was on a ship that was overtaken by Singh-pirates. Wounded, he managed to flee, was found by the pygmés (the ”bandars”) and woved never to rest until he was avenged. He created the mask and the costume, and after his death, left it all to his son, who left it to his, and so on, until today. Do observe that we’re already talking ”distant mountains” here. Singh-pirates? Bandars? The Skull Cave? A lot of things to explore and dive deeper into. Over the years – and the strips – the world of The Phantom grew bigger and bigger; a number of tribes appeared, a country (Bengali or Bangalla) where the Skull Cave and surroundings were situated, the Jungle Patrol overseeing justice in the wilderness, the island Eden, where all animals live in peace… strange going ons like The Little People and the slave trading nations in the north… freely mixing 18th or 19th century traditions and legends with the technologies of today, Falk and his co-creators created a rich world and a rich mythology – sometimes with different parts at odds with each other, but most often not – which would be just right for a transmedia developer. – What are all the different storylines that need to be collected? Can they be benchmarked against each other and either be removed from the canon of The Phantom or embraced, included and communicated to everyone associated with the brand? This goes hand in hand with…. – Re-writing the mythology, starting from the storylines that have been spared, to get as much flesh on the bones as possible and evaluating the efforts made already – how does it all fit together. – Which of the canonical storylines are at home in the real world, i.e. which can, as a casual impulse, use for instance the Internet to perform a task. Myself, I’d like to work on the Jungle Patrol and how the Patrol was created in greater detail, opening up their web presence to today’s readers, adding twitter accounts, a continuous Help The Patrol online mystery game etc, and see what other stories can be derived from the Jungle Patrol without directly involving the Phantom. – How can a storyline (or more than one) be translated to an ARG or suchlike, and where and how can such an ARG take place? The Phantom has bases all over the world and has been on adventures everywhere, which should lend any ARG-developing team a helping hand. And of course, there are a multitude of stories, that have only been briefly touched upon in the magazine or the strips, enough to create a whole Phantom shadow world as a shadow of the real world.